Instant Fix #4: How to Speed Up SLOW FINGERS on the Flute! Yep, there are 7 causes of SLOW FINGERS on the flute. Which means there are 7 ways to SPEED them up! 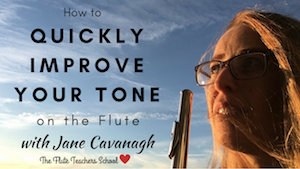 In this video I'll take you step by step through each of the way to turn your slow, sluggish flute fingers into quick, speedy and agile ones!